Just when you think that you cannot read any more political essays/news, a breath of fresh air comes along. The View From Flyover Country is a collection of essays that give such thorough background on world politics with the hometown feel that is necessary. It explains so much about what I have been thinking and feeling. Very compulsive read! From the St. Louis–based journalist often credited with first predicting Donald Trump’s presidential victory. 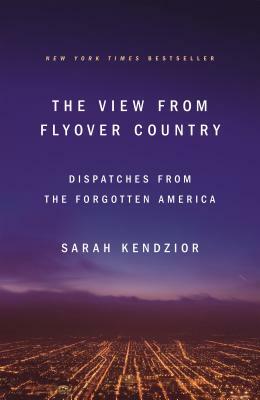 In 2015, Sarah Kendzior collected the essays she reported for Al Jazeera and published them as The View from Flyover Country, which became an ebook bestseller and garnered praise from readers around the world. Now, The View from Flyover Country is being released in print with an updated introduction and epilogue that reflect on the ways that the Trump presidency was the certain result of the realities first captured in Kendzior’s essays. A clear-eyed account of the realities of life in America’s overlooked heartland, The View from Flyover Country is a piercing critique of the labor exploitation, race relations, gentrification, media bias, and other aspects of the post-employment economy that gave rise to a president who rules like an autocrat. The View from Flyover Country is necessary reading for anyone who believes that the only way for America to fix its problems is to first discuss them with honesty and compassion. Sarah Kendzior is best known for her reporting on St. Louis, her coverage of the 2016 election, and her academic research on authoritarian states. She is currently an op-ed columnist for the Globe and Mail and she was named by Foreign Policy as one of the “100 people you should be following on Twitter to make sense of global events.” Her reporting has been featured in many publications, including Politico, Slate, The Atlantic, Fast Company, The Chicago Tribune, TeenVogue, and The New York Times. "Sharply written pieces about life and inequality in middle America."